On 17 November, the latest element of Nord Stream’s repair preparedness strategy, a subsea repair clamp, reached its destined storage facilities in Haugesund, Norway. The hydraulically activated repair clamp can restore structural and pressure integrity of the pipeline in the unlikely event that this should be needed, for instance due to a leak or other structural damage. This repair clamp is unique worldwide in terms of size and long-term applicability as a repair solution. “Owing to the high quality of the materials involved and the conservative design of the pipelines, we do not foresee repairs during Nord Stream’s minimum operational lifespan of 50 years. Nevertheless, Nord Stream stringently follows a best-in-class approach. Today’s delivery of the subsea repair clamp is an important milestone in the implementation of our integrated maintenance and repair strategy. Nord Stream is as prepared as it can be”, says Ruurd Hoekstra, Maintenance Director at Nord Stream AG. 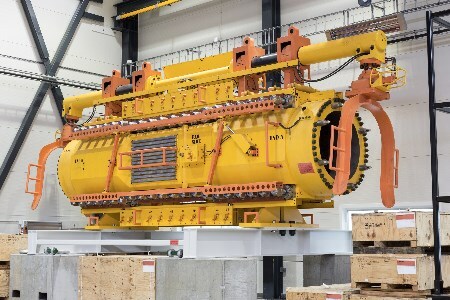 The clamp was commissioned by Nord Stream AG and produced by Oil States Industries in Houston, Texas. Its dimensions (length of 10 m, width of 2.5 m, and height of 4 m), diameter (48 in.) and weight (just over 106 t) make it the world’s largest full structural and leak repair clamp. The clamp has been designed with a varying diameter to be applicable at any point along the pipeline route. The two matched halves of the clamp can be locked around the pipeline to seal it and restore normal operating conditions on a length of up to 3 m. Hydraulically activated saddles at each end of the clamp help position it properly on the pipeline. In the unlikely event of a pipeline repair, after installation of the clamp, the Nord Stream pipeline can continue to operate normally. The clamp’s design life of 50 years matches the planned operational lifespan of the Nord Stream pipeline. It will be stored at the Statoil PRSI facilities in Haugesund.